The first lot of tournament results have started to come through since Ravnica Allegiance became legal in Standard, and this article will take a look at what decks are winning, and what decks are popular in the early days of the format. Let's begin by looking at the deck that won the StarCityGames Standard Open last week, Sultai Midrange. Not only did it win, it put two players into the top 8, and five into the top 16. It was also the deck that had the most players make day 2 of the event, meaning that at least for now, this is probably the deck to beat. As you can see, this Sultai Midrange deck is basically the same as the Golgari Midrange deck from the previous season, but adding in the card Hydroid Krasis . 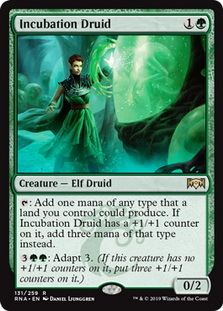 This card is fantastic: if you can manage to cast it for 6 mana, it's a 4/4 flying trampler who draws you two cards and gains you two life. It replaces Doom Whisperer in the list, and does a very good job of it as well. The game plan is the same as in the previous season; the addition of blue does nothing to change this. 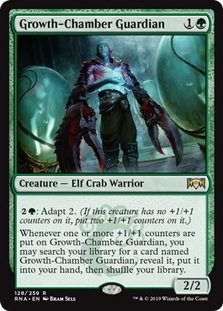 Play bigger creatures than your opponents and win that way. This deck gets rid of the explore theme that the above deck and Golgari Midrange has, and instead focuses on individual card power. Here we see the addition of some new cards such as Growth-Chamber Guardian , Incubation Druid and, of course, Hydroid Krasis , as well as using blue for Hostage Taker and Zegana, Utopian Speaker . 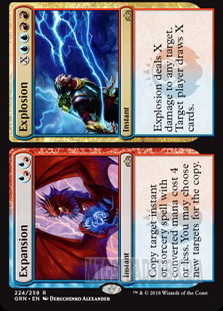 It will be interesting to see which of these two decks because the default Sultai deck of the format. 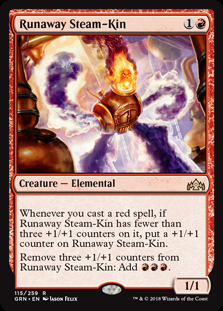 Caleb elected to drop the Runaway Steam-Kin from his deck and instead focus on two new spells in Light Up the Stage and Skewer the Critics , turning this deck into something that looks more like a burn deck than an aggro deck. 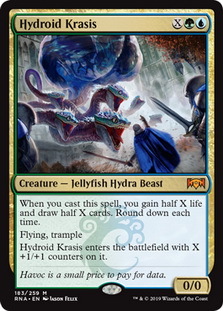 It has nineteen spells that can deal direct damage to the opponent, as well as eight creatures that can do the same. 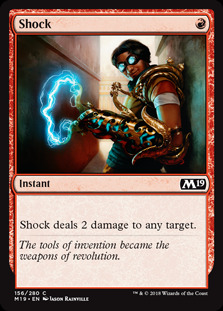 It would not Shock me (see what I did there!) 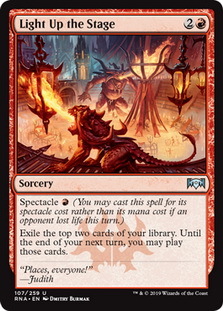 to see people start to refer to this deck as Burn in the not to distant future. This is a pretty classic control deck, with only one win condition: Chromium, the Mutable . 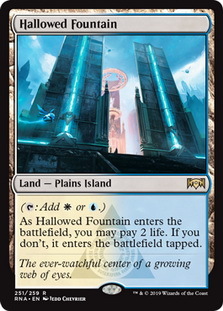 All of the pieces for this deck were pretty much already there in previous sets, with the exception of the mana base; the addition of Hallowed Fountain and Godless Shrine is what will now allow Esper to shine. 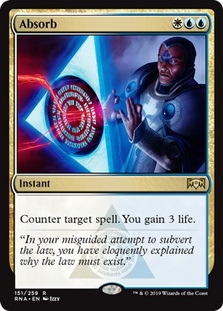 The reprinting of Absorb certainly helps, as well as Mortify and a four mana, gain-you-life Wrath effect in Kaya's Wrath . 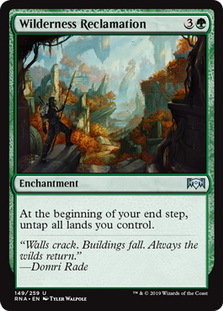 I honestly wouldn't be surprised to see this deck become one of the stronger ones as the format matures. Finally, let's have a look at a deck that everyone was very afraid of coming into this season, and for good reason. 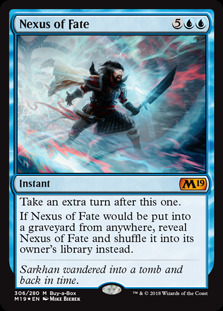 Nexus of Fate decks are not very much fun to play against, and with the printing of Wilderness Reclamation , people were extremely worried about this deck. 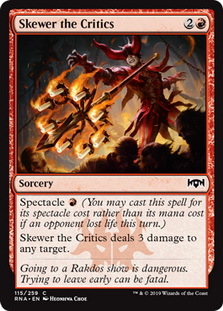 Playing against someone able to take infinite turns is not most people's idea of great Magic. Anyway, the top placing Nexus deck at the SCG Open actually finished 33rd, so maybe people will be off it a bit now. However: it did win the Standard Challenge last weekend, and this is the deck that did it. If you haven't seen this deck, it plays like a Turbo Fog deck, using Nexus of Fate to take all the turns and Expansion//Explosion to win the game. A lot of people have been calling for one or more cards to be banned for this deck, due to how unfun it is to play against. However, with a not-so-stellar showing so far, it will remain to be seen if people get their wish or not. As an aside, I am taking part in the Content Creators Community Cup. This 3-month long tournaments pits forty content creators against each other, with interesting deck building challenges. 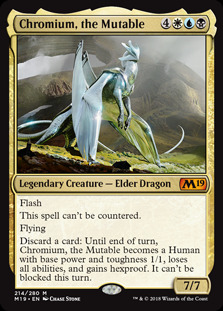 For the first month, myself and my team have been instructed to build a standard Bant deck, with the kicker being we are only able to use basic or common lands. I'll be posting updates in my articles, but you can follow along on my Facebook page.